Okay, yeah. It’s been over a week since the last post. I apologize for that. I also apologize for diverting from the previous topic, not that everyone was waiting with patient enthusiasm and bated breath as to which cheap wine I’ll review next. That’s all part of a larger project, and I’ll get back to that. I’m hand selecting this wine that I had recently for a variety of reasons. Primarily it’s because we here at the Carpe Vinum headquarters in Portland Oregon, have had a loss of one of our valued friends, family and crew. It was Mojo Jojo, our beloved bunny of the last 10 years. I can’t express how much the little guy meant to us, and I pay tribute to him by bringing up this wine, in his honor. No, he didn’t drink the wine, himself. And he didn’t share in our love of steak and bacon, being a vegetarian, and all. We picked up Mojo in 1999 when he was 5 weeks old, and about the size of a cottonball. Well, maybe three cottonballs mashed together. If cottonballs were black. Ten years ago. What was everybody doing ten years ago? Worrying about the Y2K Bug? Excited about the new VW Bug? Enjoying the peace and prosperity that was to dissipate in a few years’ time? It’s pretty incredible, when you think about it. Ten years is a long time. I considered this little black bunny part of the crew here because, besides just being a good friend, he was a great help with the working-at-home environment. If you get stressed out, pet a bunny and you feel a lot better. Bored or lonely? Pet a bunny. Writer’s block? Pet a bunny. “How is that different than a cat?”, you may ask. Well, most cats I’ve ever known, even the most friendly ones, get annoyed if you interrupt their naptime (which is about 18 hours of the day). Bunnies are almost always on the ready for a good nose rubbin’. I’ll wax poetic about Mojo and the virtues of rabbits as pets at another time. Perhaps on a different blog. Let’s talk about the wine here that we drank in tribute to a little black bunny this past week. The name of the wine should be pretty obvious why we chose that one. Sure, there are a lot of rabbit-themed wines out there. Rabbit Ridge. Hare’s Chase. Rock Rabbit. French Rabbit. 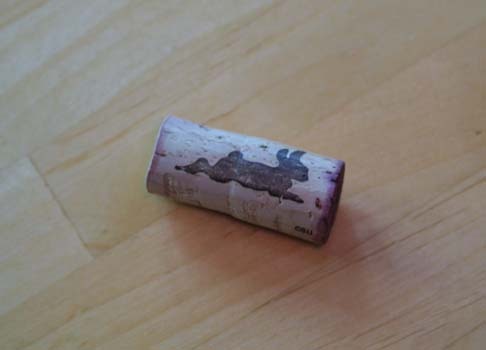 Also, keep in mind that one of the more popular wine openers out there is the Rabbit Corkscrew (that one with the grips and the handles–works great. Quick like a bunny). But nothing quite as exact as “Black Rabbit”. Besides, Edgefield has a bit more meaning to my wife and I, as we had our wedding reception out there. Another story. Edgefield’s wines have improved vastly over the last 7 or 8 years. They’ve been making wines out there since 1990, primarily for service in their chain of pubs and restaurants. If I remember correctly, we used to joke that the Edgefield wine existed on the menu to remind people to drink the beer. After time, and perhaps better sources of grapes and more experienced winemakers, things did improve and the roster of wines expanded to less of a footnote and became more of a counterpart to the famous McMenamins beer. The Black Rabbit Red is a blended red. I am unsure what the motivation is behind the wine from the strategic standpoint of the winery and winemakers. So often in this country the blended wines are the kitchen-sink of leftovers of all the “serious” wines — the run-off juice from the last pressing — whereas in Europe the blend is generally to give a flavor of the land and what grows there; the Terroir. The Black Rabbit Red may have started down the “leftovers” path, but is perhaps taken more seriously these days, as it is one of the top sellers in the McMenamin empire. This one is a blend of Cabernet Sauvignon and Merlot with a bit of Syrah and Grenache thrown in. It states that the grapes were sourced from both Washington and Oregon. For Oregon that likely means Columbia Gorge, or potentially Southern Oregon and for Washington it’s anybody’s guess. Gorge. Yakima. Walla Walla. Columbia Valley. How were the aromas and flavors? The color, the bouquet and the finish? I can’t say. I don’t remember. We were grieving our lost little bunny. It’s hard to taste anything during those times, y’know? It was good, though. Better than any of the wines I’m tasting for the Case Project. I’ll try it again in the near future and give a full report. One more thing, though. If you didn’t gather from earlier, the Black Rabbit Red and all the other Edgefield wines are only available at McMenamins restaurants and pubs and at Edgefield. You can get bottles to go, and it’s cheaper than drinking it there. (Corkage fee.) But considering that the McMenamins chain fixes up any derelict old building and turns it into a pub, chances are you have a McMenamins just a short walking distance from your house. Unless you live outside the Portland Metro Area. Then you can get it online. Here. That’s if you want to get your hands on a Black Rabbit Red. If you want to get your hands on a REAL black fuzzy bunny of all your own, to love and cherish, don’t go to a McMenamins. For more information on the joys of rabbit ownership, and how much fun it is to have a house rabbit, be sure to check out the Rabbit Advocates for the Portland area. Here. Should you try the Black Rabbit Red in the near future, please raise a toast to little Mojo: The Best little black bunny anyone could ask for!